The owners of AFC Wimbledon, the Dons Trust, have backed plans to sell the club's Kingsmeadow ground to Premier League side Chelsea. However, the sale is conditional on Wimbledon receiving planning permission to build a new stadium in Merton. 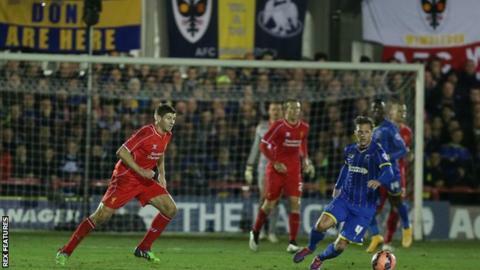 The Dons Trust, formed by Wimbledon fans, held a vote on the proposal on Monday, with 98% in favour of the sale. Chelsea intend to use the ground, which is also home to non-league Kingstonian, for youth team and women's matches. The proposed sale to the Blues is now subject to a vote by all shareholders in AFC Wimbledon next month, although approval is expected to be a formality as the Dons Trust controls 90% of shares in the League Two club. "The successful vote on the stadium sale is an important milestone in helping to return AFC Wimbledon to its spiritual home in Merton," said Dons Trust chair Matthew Breach. "There is still a lot of work to do to deliver a new stadium but the outcome of the vote shows the overwhelming support among the club's fans for having Wimbledon play where it belongs, back in Merton." AFC Wimbledon have played at Kingsmeadow since their formation in 2002 and bought the lease on the ground from Kingstonian a year later. However, the Dons have a long-standing ambition to return to Plough Lane, which they see as their spiritual home, and have submitted a planning application to Merton Council to build a new 20,000-capacity stadium on the site of Wimbledon Greyhound Stadium. Wimbledon say they will pay Kingstonian "a substantial sum of money" to help the K's secure their future at another ground in or around Kingston.